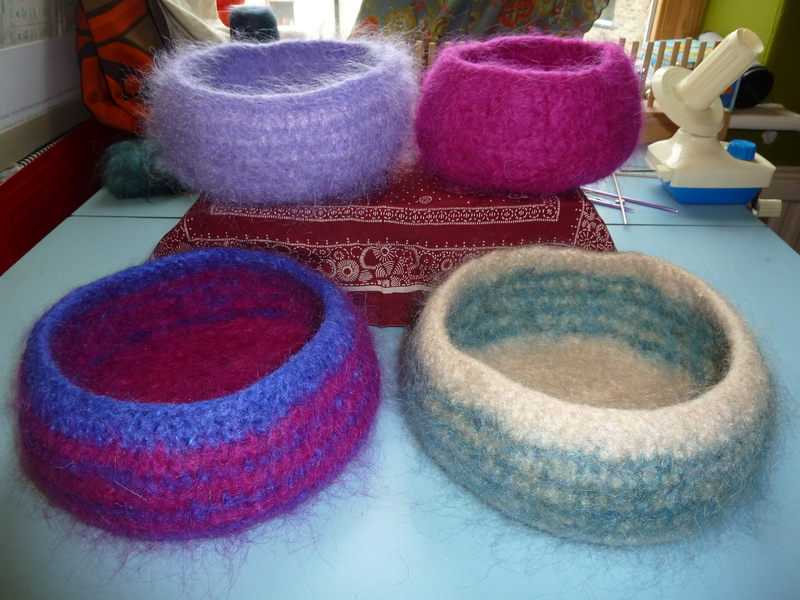 These bowls were the result of wondering what to make with the groups stash of donated vintage mohair which was a little itchy, and everyone was skirting around it. The first bowl I made up as I went along but other group members didn’t feel confident without a pattern so I’ve done a few more writing down what I was doing as I went along. The pattern below is for the cream/yellow and teal diamond striped bowl, but I’ve used the same pattern with some variations for all the bowls I’ve made. 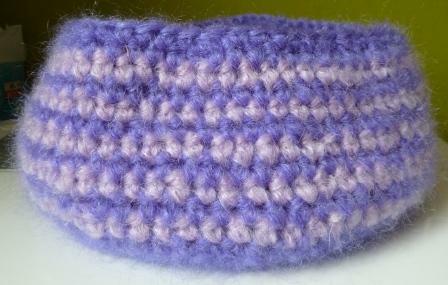 For example, the pink yarn was quite difficult to work, and whilst looking like mohair with a fuzzy finish, is mainly wool which stuck together more whilst crocheting than the mohair based yarns. As a result the gauge was quite different and it grew quicker than the cream/yellow yarn so I did fewer base rounds to get roughly the same size. For the purple and mauve version I just did rounds of dcs in alternate colours. 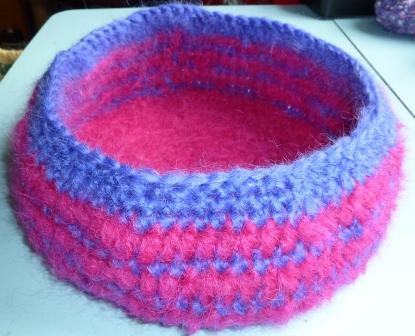 Full details of the pre and post felted dimensions and the yarn used can be found below. However, the principle remains the same for bowls of any size – make the bases and sides to the size you want and doing more decrease rows at the top if you want to pull the top rim in some more. I stuck to dcs and htr to create a smoother felted fabric. When I tried with trebles I got a bumpier more uneven effect. Do bear in mind that felting will result in a reduction of size of about one fifth. As I’m very new to crochet, and self taught, I hope the (UK) notations are OK, and because these are being felted, don’t worry if you seem to have a stitch or two more or less in any round. I haven’t tested every possible size and permutation, but it seems to generally work. 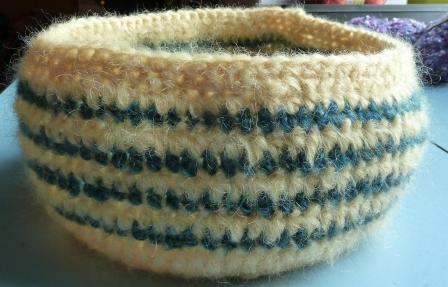 Mohair yarn with a good wool/mohair content to make sure it felts well – do check by swatching and felting your swatch. Repeat rounds 2 & 3 another 3 times or less if you want a smaller bowl. Next round: repeat round above if you want to bring the top rim in some more or if you’re happy with it as it is, simply dc around all stitches and bind off Sew in ends and use the tail from the beginning to tighten the original foundation chain loop if necessary. Felting – I just put these in the machine on a 40 degree wash with some jeans – they may need to go through a couple of times depending on how tightly you want them felted and the yarn you’ve used. 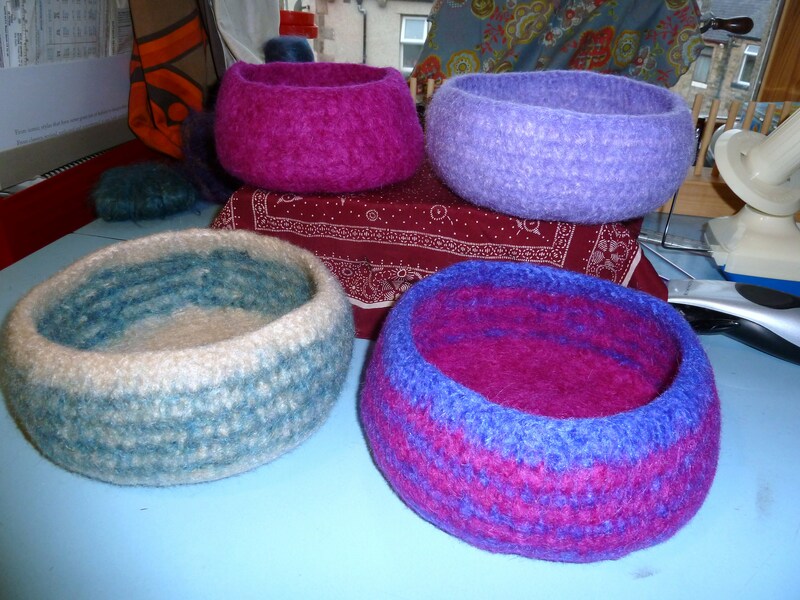 As the picture above shows, these bowls can be a bit fuzzy when finished. I’m not too keen on this so I tend to shave the fuzzy hairs off using a set on men’s hairclippers on their shortest setting. Alternatively you can use a safety razor. With either, do be careful to to shave into the fabric.